Welcome to the island of endless greenery, adorable sheep, rugged beaches, and friendly residents. In this guide I have posts from my experience all over Ireland, and while I do realize that the Republic of Ireland and Northern Ireland are two separate countries, but for the purposes of planning your trip, I have combined them. Crossing between the two you won't encounter any border patrols, and apart from using a different currency and cell service, won't be impacted from a tourism standpoint. Ireland is so much more than Guinness and Dublin (though you should definitely imbibe while you're there, it's SO MUCH better at the source). Head out to the countryside, wander into any little town or pub, and prepare to walk out with a whole room full of new friends. I love Ireland for the locals' sense of humor, the good cheer all around, and the breathtaking beauty every time you step out the door or off of a bus. These guides are for some lesser known places, but they're bound to leave an impression. Solo Travel Friendliness: You can wander into a pub in Ireland and expect to walk out with a whole room full of new friends. Ireland is famed for its céad míle fáilte (hundred thousand welcomes), and I indeed felt welcome during my times there, as a solo traveler. The country is also safe and easy to get around. Random useful tip: Irish people don't really like it when you claim to be Irish thanks to your heritage. Budget Solo Travelers ($15 - $30): Expect to pay about $15 - $20 for a basic dorm room outside of popular towns. In cities like Dublin, a dorm room may cost about $20 - $30. 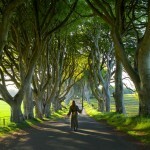 Overall, Ireland has many well located hostels with good facilities. Staying true to the céad míle fáilte spirit, expect to find a good atmosphere and friendly hosts at most hostels. The only catch is that the good ones get booked out really quickly, especially closer to St. Patrick’s Day and Christmas, so book as far in advance as you can. Couchsurfing is also very popular in all major cities in Ireland. Mid-Range Solo Travelers ($40 - $80): A private hostel room starts at around $40 - $60, with most inclusive of free Wi-Fi and breakfast. Budget hotels start at around $55 - $70. Expect to pay about $70 - $80 for a private room at a mid-range hotel. Airbnbs are popular in Ireland, with a private room averaging at $65, and an entire unit averaging at $140. Other Accommodation Options: If you have the budget to splurge, check out the possibility of staying in a real castle in Ireland. The country is home to some of the most beautiful castles in the world, and many of them have turned into accommodation for those who fantasize waking up in a castle. You can also build your own castle – a.k.a pitch a tent and camp at one of the many campsites in Ireland. Cheap Eats ($10 - $15): Food in Dublin is expensive, but you can get creative and cook your own meals. Check out the local farmers markets where you can get fresh ingredients that cost much less than eating out. When you do eat out, keep an eye on restaurants that offer early bird deals and just have your lunch and dinner earlier - particularly in small towns where restaurants close early. Outside of Dublin, expect to pay about $10 - $15 for a simple meal at a restaurant or pub. A pint of Guinness costs about $5. Restaurants and Pubs ($20 and up): Expect to pay $20 - $35 for a decent meal with a drink in a restaurant in Ireland. Most pubs in Ireland serve food – not bar food but actual meals like meat stew, sandwiches, and more, often at a reasonable price range. While Ireland has never been popular for its cuisine, the new generation of chefs are working on changing this perception by recreating traditional Irish dishes with fresh, local produce. I especially enjoyed the seafood in Galway and along the Wild Atlantic Way. One big tip is to look out for Good Food Ireland signs for high quality restaurants. Getting There: The main international airport with the most tourist traffic is Dublin Airport. Though you should look into the 4 other international airports as the flight tickets could be a lot cheaper. It is also possible to take a combination of a train and ferry from Britain to Ireland. Another option is by bus, which could be cheaper than taking the train, though it would take much longer. Getting Around Town: Buses and trains are the cheapest way to get around town in Ireland. They are comprehensive and really comfortable, with free Wi-Fi on all buses and trains! In Dublin, there is a bike-sharing scheme, which costs about $1.20 per trip. Though if you ask for my honest opinion, most cities are best explored on foot. Bring an umbrella! Inter-city Traveling: Given Ireland’s size, traveling from one city to another is quick and easy, best with trains and buses. A single train ride from Dublin to Galway costs about $45 and takes about 2.5 hours. Bus rides typically cost $10 less than trains. To see areas that are unreachable by public transport, consider renting a car, which could be inexpensive if you can find someone to share the ride with, or if you opt for a smaller model. Expect to pay $30 per day for a small car. Keep in mind that you’ll be driving on the left and the roads are often narrow. ‘Craic’ it up in Dublin: Dublin is the best place in Ireland to party and enjoy a night full of craic. Ask your hostel for pub recommendation, order yourself a pint of the country’s most loved export – Guinness, and prepare for a good night out. During the day, admire the city’s beautiful architecture, visit the museums and galleries (most of them are free! ), and tour the country’s oldest university, Trinity College. Explore the Wild Atlantic Way: WAW is a road that wraps around the island and is the longest coastal drive in the world. Start from Galway and drive along the coast to Clifden, passing through the Silver Strand and Two Dogs Bay. From Clifden, continue to Kylemore Abbey, Killary, and end your road trip at Donegal. If you don’t feel like ending it right there, continue into Northern Ireland, my favorite part of the island. Play Game of Thrones in Northern Ireland: Put on a cape, bring your (plastic) sword, and head to one of the many GoT filming locations in Ireland. Even if you are not a fan of the show, The Giant’s Causeway, the beautiful forest, the mesmerizing castles, and a huge cave called Cushendun will ensure an unforgettable experience, and they aren’t even all that Northern Ireland has to offer! Walk in Connemara: For an off the beaten path adventure, hire a car and drive to Connemara on a Sunday, and join the walking groups to experience some of this rugged coastline. It is a part of Ireland that is still relatively wild and rugged, and the population remains low, which makes for a fairly interesting region to explore for those who are not a fan of tourist areas. Cycle the Great Western Greenway: Hop on a bicycle and explore the western Irish coast from Westport to Achill. I recommend stopping for a night at one of the cottages along Cnoc Suain, which is incredibly peaceful and warmly welcoming at the same time. Celebrate St. Patrick’s Day: Originated as a feast day for the Irish patron saint, St. Patrick’s Day is more of a secular festival celebrated globally these days. If you find yourself in Ireland on St. Patrick’s Day, dress up in green, head down to a local pub or join the parade, and dance your day away to Irish music.